Thus spake Mike, our host for the week. “Hardly any uphill and loads of downhill” he enthused. It seemed like we had to do it. 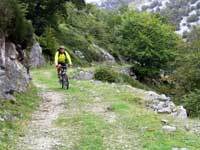 The only possible fly in the ointment was the cable car: according to their rules they will only take mountain bikes (BTT in Spanish) on the first cable car of the day which is at 10am. Shouldn’t be too bad you think but Fuente Dé is a good half hour drive from our accommodation and most days we are only breakfasting at 9am! Best get up early. We get to the cable car station at 9-55 and there has already been at least two cabins leave. I rush to the kiosk and discover that I have left my money in my trousers back at the B&B! Steve throws me his wallet which debouches all its coins over the floor as I catch it. Fortunately there is hardly anyone else around and we are allowed on. Ten minutes later and we are standing outside the upper station. Result! The day is cool with a northerly breeze but clear. The initial track is uphill but only gains 80 metres or so in a kilometre. 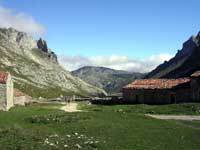 This brings us to the col behind Hdena de Covarrobres. From here we can see the first half or so of our first main descent. Steve sets off and races ahead, Cath not too far behind, while Angela and I proceed more sedately, trying to take in the views. Pretty soon we come to a steepening and the track zig-zags back and forth across the hillside. The surface is generally good but there are sections where the surface has been pulled apart by four wheel drive vehicles (they run trips up here). We pass a couple of cyclists, possibly British, before catching up with Steve at a stream crossing. 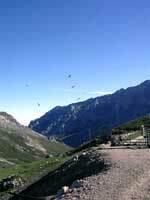 As we move off, a group of Griffon vultures flies up from its roosting site on a small bluff. This is enough to get us to stop and take photos of these huge birds - they are not the sort of thing that you get in the UK! 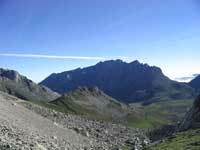 The track eventually leads to the Refuge di Odriozola where we make a small climb before descending a long ridge. The ridge gets steeper and rockier and it becomes hard to get a good line. As we drop down the rocks become bigger and progress becomes more difficult. Eventually however the ground levels out and we regroup by a large boulder - ahead and to either side are mountain horses left here for the summer grazing. The track continues and heads into a narrow gorge where the surface becomes looser and looser. The fact that the gradient is also steeper does not help. The gorge debouches into the meadows of Las Vegas! Well Las Vegas del Torro which is really quite pleasant. A quad bike revs past us on its way uphill. Just beyond here we are brought to a halt by a local farmer moving his cattle. We use the stop to have a quick snack. By now the track is better surfaced and we speed down to join the road below Sotres. The climb up to Sotres is steep and we are not used to it having been spoiled with the best part of 10K of downhill up to this point. The village has three bars all within 100m of one another - easy pub crawls around here! We fetch up at the central one and settle down for some lunch. Entertainment is provided by two Brits on motorbikes who manage to get lost in a village that sits astride a single road! Eventually they head off in the right direction with us doing an impression of “the road goes thataway”! Cath nearing the end of the steep climb out of Sotres. Lunch over and the hard work of the day begins: the climb out of Sotres to the Hitu Escarandi some 300m higher and about 2.5 kilometres away. We should be used to this by now, but whatever. Eventually the climb eases off and we have only 20m to climb in a kilometre (meaning that we have climbed 280m in 1.5k !!). Now more fun begins as we head off-road again to drop down to Bejes. The entrance to the track is blocked by boulders and a hand-written sign that Steve translates as “Embarressed road”! The initial section is steep but no worse than we haven’t dealt with already today, then it gets steeper. The track is now on bedrock and together with the loose material kicked around by off-road vehicles this makes descent tricky. If you get the line right though it is all rideable and leads to a grassy meadow on the edge of woods. A further few tricky moments and the track levels out for good. Myself on the miners track. The track we are following was made to serve old lead mines but has long since fallen into disuse in this respect. Now, it makes for good biking. However: what a track! It cuts through cliffs and clings to the hillside for several kilometres, the drop to our left making us thankful that it is wide enough for a Land Rover and is not singletrack. Eventually the track swings away from the drop to our left and enters a side valley. It swoops round this and cuts into the woods. Good speed is made through here and eventually we come to a track junction. The upper track comes down from the Refuge Andara and is meant to be a great descent. (take the uphill track from Hitu Escarandi to get to the refuge) At this point a couple of Spaniard cyclists pass us. Steve and Angela head off so that we can get some shots of them on the track on the other side of the valley. By the time they are spots in the distance Cath and I set off. The Spaniards have stopped at a spring to refresh themselves so we press on to join the other two. 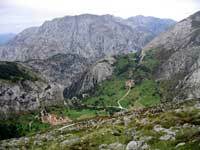 "Beginning the descent to Bejes. We are now coming to the end of the major ridge - things are opening out - I certainly wouldn’t want to drop off leftwards off the track as the slope ends about 100m away in a large cliff. As we continue the track begins to drop down and our pace quickens. A small hut has dogs outside that seem particularly agressive so we dismount and walk past, our bikes acting as guards. The track is both steeper and looser now, and switchbacks are starting to appear. At one point we see the village of Bejes way, way below us. It seems as if we have to descend a cliff to reach it. Not only that but the road leading away from the village is also full of zig-zags indicating steep gradients. The village of Bejes, far below. After a few hairpins we hit concrete. I am surprised that they have concreted this far up the hillside. However it makes for smoother riding after all the rough stuff. Suddenly I notice that the concrete looks greener, and greener, and greener! Now Cath is leaving tyre marks in the surface! Oops! It's fresh! We clatter off the end of the concrete and run over reinforcing mesh and come to a halt. Ahead is a barrier of mesh around which we clamber and pass the bikes. As we continue down, we meet the workmen coming up from their siesta - they are not happy - and shout at us in Spanish but we have no real idea as to what they are saying. As we descend further we come across more workmen coming uphills, one or two of them are not pleased but again we plead ignorance. Bejes whizzes by in a blur and we drop down the hairpins of the access road. By the time we hit the main road we have lost Steve. He turns up a few minutes later - he had to stop to cool his rims off in a trough of water! The main road back to Tama is uneventful though the promised tail wind fails to materialise. From the upper station of El Cable take the jeep track leading to the col at the end of the line of crags. Go over the col and descend to the refuge. Bear left here and continue with care down the ridge in the centre of the valley. Pass through Las Vegas del Torre and join a track that comes in from the left. Climb up to the surfaced road. Go right and climb up to Sotres. The climb continues straight ahead for another 2km or so. At the second group of huts take the left hand of two tracks that leave the parking area on the right-hand side of the road. This drops steeply to a meadow. Continue along the track - with big drops on your left to a spring where the track from the right joins. Carry on around the next hill until the track begins to descend. Take care on the many hairpin bends. Eventually you arrive in Bejes. Go through the village, the road sweeps around to the left to a cross-roads. Go straight on and down the next set of hairpin bends until the angle eases. 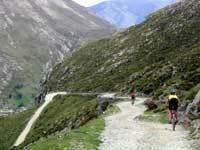 Keep on the main route as it descends yet again until the main road to Potes is reached. 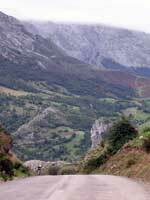 Turn right and head back along the canyon road to Potes. Macizos Central Y Oriental de Los Picos de Europa 1:25000 scale published by Adrados. Picos de Europa y El Valle de Liebana by Victor Guerra, published by Desnivel ISBN: 84-87746-27-6 (Spanish text) This does not have this particular route described but parts of other routes cover the same ground.